I have been accumulating a big pile of CDs that I have been meaning to mention here, let’s make a start at reducing the size of that stack. These are not new CDs, not even recent ones, just items that I have been listening to relatively recently. 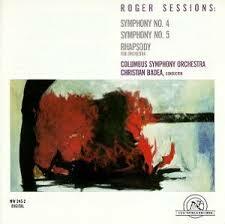 Roger Sessions: Symphony No. 4, Symphony No. 5, Rhapsody. Columbus Symphony Orchestra, Christian Badea, conductor. You and I will most likely never hear this music performed live, sad to say. Mid-century American symphonism finds little place in contemporary orchestral programming, with a few exceptions (Slatkin, Schwarz) to the contrary. Surely the Hanson 2nd could find a home alongside the relatively user-friendly pieces that Robert Spano champions in Atlanta (However, I must say that, if forced to choose, I would prefer to see living composers performed). Surely the Rochberg 2nd, and the Harris and Schuman 3rds deserve to see the light of day (Bernstein championed and recorded the latter two pieces for DG). I don’t know all the Sessions symphonies, so I can’t say what the strongest works among them might be, but even though they are more challenging for listeners than the music of the “Atlanta School“, there is music here that should not remain on the library shelf. 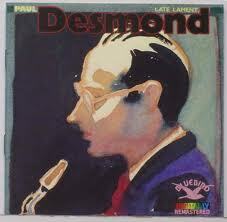 Paul Desmond: Late Lament. I love Desmond’s playing, so it is sad to say that this is pretty dreadful stuff. The rhythm sections for these 1961 and 1962 sessions include masters such as Milt Hinton, Jim Hall, and Connie Kay, but the players are enveloped in pretentious and saccharine orchestral arrangements. (If the harpist was paid by the lush glissando, she could have retired after this gig.) It makes you realize that Desmond might have been better served by the sometimes astringent and awkward backdrop that Brubeck provided (or by the simplicity of the bass and drums texture when Brubeck was silent), as well as appreciating that Desmond’s other records with Jim Hall, while more mellifluous than the Brubeck quartet, never cross the line into the cloying territory where this disc resides. *) By the way, I was appalled to see that the Cleveland Orchestra appears to be playing exactly one piece by a living composer (Rouse) during all of the coming season. I actually have the Sessions album (on LP), and remember liking the Fifth as well as the Rhapsody. I actually remember hearing Ozawa conduct the BSO in Sessions’ Concerto for Orchestra (his last work, probably in its New York premiere) at Carnegie Hall, the only time I think I ever heard a live performance of a Sessions orchestral work. Yes, I like the Concerto for Orchestra – I wasn’t at the concert you mention, but I have the LP of it (backed with a not terribly interesting Panufnik piece (Andrzej, not Roxana)). I wonder if you (or Steve) have heard the violin or piano concertos? There’s that Imbrie article about the violin concerto that makes it seem like an important breakthrough for Sessions. I missed the performance of the piano concerto that Rebecca LaBreque gave during our student days. I find The Black Maskers Suite far superior to any of Sessions’s symphonies. The first four symphonies for me all have their moments, even an occasional memorable movement (the first movement of the third has always grabbed me), but overall I find them dull – well-meaning, in many ways of course on a high level, but rather uninspired. The first piano sonata and the second string quartet, however, have meant a lot to me ever since I was in college. Hi Steve, and thanks for reading. Thanks too, for bringing up Black Maskers. At one time I think this was sort of Sessions’ Firebird – an early, somewhat atypical piece that was more frequently played than his other works. I always found the first piano sonata a little bland, though the opening tune is certainly lovely. I prefer the second and third sonatas which strike me as more vivid. Can you say more about why the first is meaningful for you? It’s always hard to put these things into words, but, to use the word that some people find irritating, I find his harmonic language usually “gray,” whereas in the first sonata I don’t find that. Even that sonata, I think right before the finale, has a very Regerish contrapuntal section that presages what I find to be the grayness and (to use another word offensive to many) academicism of much of his later music, but overall I think the material is good, the piano writing effective, and the form successful. Copland wrote about this sonata in one of his books, quite favorably though with some reservations. Yes, I know the violin and piano concertos. For me the piano concerto is thoroughly deadly; the violin concerto has a striking beginning but I don;t know what happens after that – it just seems to me like more uninspired meandering. Wish I could really enjoy more of Sessions, I’ve always tried really hard but only very occasionally succeeded. I remember my teacher robert Parris saying that everyone respected his music but nobody liked it. I am glad to see these responses about Sessions, a composer whose music should be played more–or played at all. Thanks to youtube much of his music and that of other outstanding American composers is available for our enjoyment or at least consideration. I have found some of Sessions’ smaller pieces easier for me to grasp, for example, his 6 Pieces for Solo Cello. There is a great flexibility, particularly with rhythm, but also with interval (harmony), that I think comes through more here than in his ever-pointilistic orchestration (although that’s fun, too). I find it quite expressive. Another composer–and Session’s student–who I really like is Andrew Imbrie. His Requiem, for example, is beautiful. I wish I could hear this music live!